26. Hunab K'u Has Flashed Like Lightning! In the Mayan religion, the serpent symbolically represents the seven powers of light, energies distributed throughout the body as a gift of the Giver of Movement and Measure, Hunab K'u (the Creator). The seven powers combined and awakened form a circuit of energy focused through the crown of the head to join in the Dance and Flow of energies of the Creator. "Have you felt the deep inner calling of hidden truth? Do you feel sacred knowledge is just waiting for you to grab it? The Mayas believe this coming spring is a time when you will begin to remember. In the spring of 1995, we are to enter a new cycle of time that the Mayas believe will be deeply profound and exceptionally transforming, far surpassing what we have experienced to date. 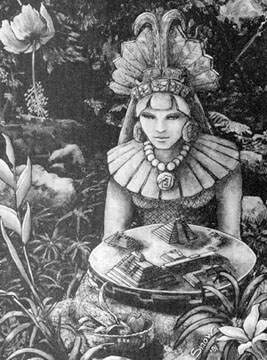 By the use of ancient calendar cycles based on the cosmos, the Mayas understand that the spring equinox of 1995 is the completion of a Mayan prophesy that marks the end of two cycles of K’altun (two cycles of 260 years), bringing us to the time when ancient and hidden knowledge is to be reawakened in the human DNA. The Mayas understand it is the end of the "age of belief" and the beginning of "the age of knowledge." The Mayas called it the Itza Age — or, as our Western world says, the Age of Aquarius. With the initiation of this new cycle of time, we will no longer be veiled by illusion. We will remember all that has been forgotten. The limitations of the unconscious will be wiped away. Hunbatz Men, a Mayan shaman, asked me to share this ancient Mayan prophesy and a simple solar initiation. He said this information is for everyone, not just the Maya. He said being Mayan is something that is in the heart and spirit, not just created by the color of the skin. This sacred prophesy is the call for the light workers of the earth garden to reunite and harmonize the Earth, to bridge the gaps between the continents, religions, cultures and races for all ages, for all time. It is time to sing our heart songs and begin to live our true solar destiny. "In the year 1475, before the arrival of the Spanish, the Supreme Maya Council revealed that a calendar cycle of twice the K’altun of 260 years had to go by in order for the Mayan Solar Culture to flourish again for the benefit of mankind....In the spring of 1995, this 520-year period will be completed, bringing to an end the cycle of darkness brought by the Spaniards to the land of the Sun....1995 is a decisive year and the sacred human race will have to enter the path of cosmic light if it is to remain a thinking species....The human race will have to seek the path of initiation on Earth and in Heaven....Through Solar Initiation they will be able to see the luminosity of the great spirit....through Solar Initiation, the sleeping body of mankind can be awakened....Hunab K’u [the Mayan name for God] will flash like lightning that will pierce through the shadows that envelop the human race. Let us prepare to receive the light of knowledge that comes from Hunab K’u and transcend into the memory of the creator and become beings of eternal luminosity." "Quetzalcoatl taught the ancients all the necessary skills to advance their civilization, from mathematics and science to agriculture and astronomy, as well as the famous Mayan calendrical formulae which predicts the end of the world to be December 21st 2012. He taught the people to live in peace and then moved on disappearing across the sea, but he promised he would someday return. Unfortunately for the ancient inhabitants of Mexico they mistook the arrival of the Spanish conquistadors and Cortez in 1519 as Quetzalcaotl's return, bringing about their tragic doom. Accepting them with open arms and treating them with utmost reverence the ancient people expected their newly arrived god to bestow great benevolence upon them. Instead the Spanish invaders brought nothing but greed and brutality for their trusting hosts. So then, on these two very important dates, the vernal and autumnal equinoxes, it appears that Quetzalcoatl is indeed present among his people as the shadow of the serpent moves along the steps of the Pyramid of Kulkulkan. "This Power is placed in the triangular bone which is called as sacrum, which means Greeks knew about this centre. They very well knew about it, that’s why they called it sacred, sacrum. In many countries there has been a manifestation that they know about this particular Power. I happened to go to Colombia where I collected an authentic antique copy of the antique necklace. The necklace had at its bottom a Kundalini and even the earrings had the Kundalini, but, surprisingly, it was from the Indians of America, though it is now kept in the museum in Colombia. It was in America that people knew about Kundalini, definitely absolutely in three and a half coil they had done this pattern very well. Is very surprising that it was done even before Columbus came here." A most fascinating ancient Native American archaeological site found in Ohio, USA, called the "Great Serpent Mound", features an undulating snake's body, its coiled tail reminiscent of the Kundalini lying dormant in the sacrum. In its mouth appears an egg, symbol of the potential actualization of Second Birth. Is it possible, then, that the ancient Native American Peoples were worshiping the Divine Feminine and were deeply aware of the symbolic, spiritual significance of the Serpent Power and the Primordial Egg? 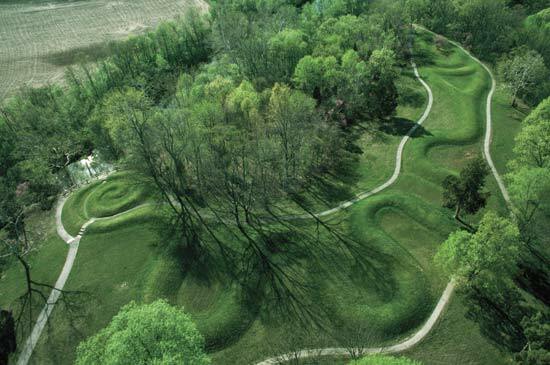 Although scholars are uncertain as to the precise significance of this Great Serpent Mound, it is, however, highly likely that this site was revered by American Indians as the sacred representation of Kundalini awakening (Second Birth). "The Great Serpent Mound, in Adams County, Ohio, USA, is considered to be the world's largest serpent effigy. The mound is a quarter of a mile long and five feet high, and it was originally much higher." "The Great Serpent Mound continues to wind its quarter-mile length along an Ohio hilltop...By the end of the nineteenth century, archaeologists were able to show that the mounds had in fact been built by Native American civilizations many centuries before-a-long-lost-civilization such as Greece, Persia, Holy Land or mythical island of Atlantis." In the Mayan religion, the serpent symbolically represents the seven powers of light, energies distributed throughout the body as a gift of the Giver of Movement and Measure, Hunab K'u (the Creator). The seven powers combined and awakened form a circuit of energy focused through the crown of the head to join in the Dance and Flow of energies of the Creator. This flowering of energy through the crown chakra was often depicted through brightly feathered headdresses for the priests. The legends of Queztalcoatl are that he would appear as a rainbowed serpent with a crown or ruff of brightly colored feathers, as a macaw, or as a man with feathers waving from the top of his head - the headresses of the priests imitated and honored the feathered coif of both the serpent and the humanoid form. The Hindu seven chakras match and are the same as the Mayan seven powers of light. The Mayan colors for these power centers are different, being the wavelengths/colors of the rainbow flowing upwards from red at the base chakra to violet at the crown. These seven colors together form the light of the sun, and the rainbow gives the pathway and seven steps upwards through the seven power points of "light" located within the human body. The water and air (rain/mist) break the light of the sun into the seven separate colors/powers. The seven notes of the major scale in chakra toning correspond directly to the seven wavelengths of the rainbow color scale, as each tonal vibration going upwards is slightly increased in speed of wavelength. The Hindu word kundalini directly corresponds to the Mayan word k'ultanlilni (a combination of the words for gods/pyramid/speak/ vibration/nose/vibration). A brief digression on that "nose" reference in k'ultanlilni: By Mayan tradition, the Divine breath enters through the nose. This concept is often represented in sacred art by beings with large noses that look like elephant trunks, inscribed with signs and glyphs representing the wind and planets. The nose, the wind and the planets have a direct cosmic relationship. Mayan priests are depicted with large prominent noses; it is unknown if this is artistic license gifting the priest with the Divine Nose by virtue of his position, or if Priests were encouraged and selected from among the prominently proboscid populace. The seven powers of light are represented in temple pyramids as seven triangles of light on the steps of the temple in Chichen Itza, Yucatan, that appear during the vernal and autumnal equinox. The number seven is sacred within Mayan culture. It is considered to be the number of the Divine and a reminder of the galactic forces and energies from which the Mayan religion formed. The seven isosceles triangles that form on March 22 and September 23 on the steps of the temple in Chichen Itza, Yucatan, allow the Priest to ascending the pyramid through the seven powers of light and into the mouth of the serpent of sacred knowledge. The triangular and pyramidal energy conduits are based upon the structure of the water molecule. The bioelectromagnetic energy released from the inhalation/exhalation and the body's transformation/change of oxygen to co2 creates the energy released (the change in angle of separation of hydrogen on either side of the water molecule (h2o). My interpretation of this is the Divine breath brings water and air together within the body to form the fire of bioelectric energy. This energy focused through breathing and energetic concentration through the chakras in sequence produces the Serpent. The Mayans had specific words to use to awaken these powers. Kulkulcan is a combination of k'ul (sacred vibrations), and can (sacred teaching). The energy radiating from the crown chakra (often symbolized by feathers) is cizin. Inlilnaluk' translates as "to receive sacred knowledge (literally self/vibration/mount/swallow)" and lol is "relationship between vibration and spirit". The beginning colors of the seven powers of light, red flowing into orange, is considered the color(s) of the galactic force (Milky Way Galaxy); the word for that color combination/force/energy is chacla." The prophecy was written by the Supreme Maya Council in 1475, before the arrival of the conquistadors. Almost in anticipation of the bearded conquerors from the east, the council said that a time of darkness was near at hand and that two K’altun had to pass before the Mayan solar culture would flourish again. Once the time had passed, the council predicted, Hunab K’u — God, in Mayan — would flash like lightning and pierce through the shadows that envelop the human race. The council said that then we would begin to remember the ancient knowledge of the universe. That flood of knowledge would bring the rebirth of humanity’s spirituality and a unification of the people of the Earth in an age of peace. Where we are going is to something brand new, something never seen before in the history of humanity." A Time Warner Company, 1997 p. 15-7. March 16, 1999, will be, in my Mayan calendar, the day K'AN-10, month UAYEB-3, year CHICHAN-12. On this date, we will perform Mayan ceremony and will consort with the planets Saturn, Venus, Mercury, Jupiter, Father Sun, Sister Moon and the Pleiades. This ceremony that will be carried out in the water of the cenote is to help us enter into the new era of Aquarius. The planets previously mentioned will be in the sky in the middle of the day to observe us and to help us enter into this Mayan cosmic initiation, into the knowledge of the new Magnetic Pole of Spiritual Education. The whole of humanity today needs the education coming from the cosmos, because, as it is known, the education of modern civilization is not complying with the universal creator's correct educational mandates. Many times it contradicts it without understanding it; today we have an imposed civilization personified by humanity's manipulators. Only the wisdom of the new cosmic time will come to correct that which has been badly done, only the great creative forces of the cosmos and of Mother Earth will correct the mistaken road that was imposed upon humanity. Only the universal creators TEPEU, GUGUMATZ and HUYUB CAAN will disturb 2000 years of mistaken direction, and they will eradicate these thousands of years of darkness. Let us see, with our true human power, a little of our Mayan cosmic solar memory. In this way we will begin to understand what we have nowadays forgotten. Not knowing how to remember also has to do with the bad education that was imposed in all places where western colonialism reached. Today our obligation is to begin to remember. As Mayan I can remember with my cosmic mind, and you also, kind reader, can begin to remember with your cosmic mind, because you also are Mayan, you are a cosmic being who has come from HUNAB K'U, from the new time of universal wisdom. When the universal memory began to wake up in remote times, there we were with our spirit. When our sacred body began to form, it had already been impressed in its first manifestation of life the memory of the universe. Afterwards everything was concluded for the great creator HUNAB K'U, our god that made us according to the great universal law. HUNAB K'U put the sacred measure in our body and spirit and also included the proportion of the universe in us. When the creator HUNAB K'U concluded its creation, it gave us a little of its power, endowing us with seven corporal and spiritual powers. There are two more powers that we cannot take until we understand and develop the seven powers. One of these two powers is up in the universe and the other one is below in nature. They are complementary powers to the other seven powers that correspond to our body and spirit. Inside our memory as great power exists our religion. This is an aspect so important that current humanity has not been able to understand it, because 2000 years of religious competition have confused even more of humanity. The proof we have of this is the great quantity of religions that exist in the entire world. One of the main current misfortunes is that each religious group says that God the creator is only on their side and that they are the chosen people of God. It is important that humanity understands how the Maya of tradition understand the religious principle, of how it governs the actual body that we have. Accessing some of our ancestral memory will take us to remote boundaries of our existence; it will make us remember the lands and religion that do not exist today. We cannot see them because those great sacred lands and religion are under the waters of the sea. When those that write history did not yet exist, religion already existed and was practiced by many people. When the god HUNAB K'U made the first cell of the human being he made it religiously. For this reason the human being was born of religion and consequently is religious from his root. In his cosmic thought is his religion, in his universal spirit is his religion, and in his earthly body is also his religion. Many thousands of years that can go back to millions, the human being was in many lands that today cannot be seen physically, but, however, this information is in the memory. The Maya knew about this memory and wrote of it in their sacred books and stelae, and also shaped it in their pyramids. It is necessary to remember this history, because this information can help humanity reorient so that we take our true road, so that we no longer believe in the false history written or planned by some historians like Robert Charles Darwin, Sigmund Freud, and the Constantines. Before the Maya arrived in the sacred lands where today we trod and live, they were in other lands that today are under the waters of the sea. They emigrated to many places as well long ago, as did a lot of people of different ethnic groups. In very remote times they lived in places with very high mountains sometimes covered with many trees and other times with a lot of ice; they were also in desert lands that sometimes became very fertile lands. Many of those lands arose from the waters, others disappeared with time; some transformed into very big lands, others into small lands. The Maya can remember the last great sacred lands of the continent of Lemuria, or LEMULIA in the Mayan language, there where the cosmic religion that came from another continent that today rests under the waters of the sea was understood and practiced. Many peoples inherited the sacred symbols of LEMULIA, such as for example the symbol called the star of David of the Hebrews. 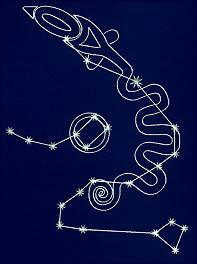 In the times of LEMULIA, the symbols represented the summary of wisdom. They also represented religion. They worshipped the symbols, not like some religions that commercialize these sacred symbols nowadays. The true sense of these symbols come from LEMULIA. Still the majority of humanity cannot understand them. In order for the human being to understand these symbols, he has to enter into the land of the cosmic initiation. Some indigenous groups, such as the Hopis, were in the sacred lands of LEMULIA. They came from the south of the American continent in order to settle down in what today is the United States of North America. When they arrived in these lands, many of the lands were under the sea. The Hopis have in their registered memory the big changes that have occurred to the sacred lands of the north of this continent of America. Every several thousands of years, the Magnetic Pole of Religion arises in a different part of the Earth. When this happens, the ancient wise men of knowledge travel, taking with them the previous Magnetic Religious power that they took care of in order to deposit it in the new location. When in LEMULIA this great power indicated by the cosmos and Mother Earth arose, people with high degrees of initiation traveled to help ease the activation of this new sacred place where the New Spiritual Education would arise. Through the passing of the millennia, LEMULIA fulfilled its sacred mission as educator of humanity. From here arose many teachers whose names are not remembered by human beings today. From this continent we inherited many symbols of cosmic wisdom that are still used today. When the time of LEMULIA completed its cycle indicated by the Mayan calendars, LEMULIA returned under the waters of the sea. The Itzaes of tradition can remember when we were in the continent of Atlantis or ATLANTIHA in the Mayan language. For thousands and thousands of years we lived in these sacred lands where we ended up understanding the reason for our existence on these lands created by our supreme HUNAB K'U. In those remote times our sacred religious symbols were in all the locations of the continent of ATLANTIHA and those that inhabited these lands could understand these symbols that represent all. When ATLANTIHA arose from the waters of the sea, many teachers came to deposit the religious sacred wisdom to this new place; they came following a cosmic order. The LEMULIANS were present in order to deposit the great power to the ATLANTIHANS. With rites and ceremonies they made the transitions of power. Then Mother Earth was pleased by the great respect that was given, for in that time the human being understood when Mother Earth gave an order to change the Magnetic Pole. In lands of the continent of the ATLANTIHA, there existed many communities that understood the cosmic spiritual work. Inside these communities, the old Itzaes, for many hundreds of thousands of years, cohabited with this cosmic wisdom in the continent of ATLANTIHA. Here there arose more sacred symbols about which they gave teaching and the symbols were also worshipped for the totality of universal wisdom that they contained. All time begins and also finishes. The cycle indicated cosmically by the calendars also marked that the continent of ATLANTIHA would arrive at its end. When this began to happen, many communities emigrated to other places. In this way great ATLANTIHA arose from the sea and in this way returned to the sea. The Magnetic Pole of Spiritual Religious Education had already fulfilled its cycle of educating humanity, and cosmically the order had already been given that this great power would have to be in another location on Mother Earth. Many teachers of ATLANTIHA emigrated to other lands and took the spiritual and scientific knowledge with them to their new establishments. The ATLANTIHAN/Itza community also had to emigrate to new lands. Here it is where the great continent that is today called America arose, but the original name of these sacred lands for us, the Itzaes of tradition, is TAMAUNCHAN. Before settling in these lands that we inhabit today, the Itzaes traveled to many places, among them are mentioned the sacred lands of today's indigenous Kogis. When the indigenous Kogis-Taironas arrived in the high lands of what are today the countries of Venezuela and Colombia, the forests of today in the country of Brazil did not exist. This fact indicates to us great antiquity. These indigenous brothers settled in the high lands of Sierra Madre of Santa Marta; these are geographically located between the western part of Venezuela and the eastern part of Colombia. Also what is today the Yucatán Peninsula, México, and the lands of Central America were under the waters of the sea. When these sacred lands arose from the waters, then the Itzaes arrived. They already knew what would be the destiny of these new lands. The Magnetic Pole of Religious Education of ATLANTIHA had already reached its end; Mother Earth and the cosmos had already indicated which would be the new location where the new religious-scientific education would arise. At that time, the Itzaes that had waited for these new lands of light ended up populating these sacred lands. They brought the sacred symbols of the inherited wisdom of ATLANTIHA to deposit here. Note: I must indicate that there already were inhabitants in the high lands of this continent of Mesoamerica. Then arose the great TAMUANCHAN as a continuator of the Cosmic Spiritual Education ordered by the new Magnetic Pole. In these sacred lands arose the high initiatic degree of Kukulkan, or K'UUK'MEXCAN in the Mayan language. In that time Itza educated the initiates in order to understand the symbols of the snake and the eagle, when the initiates understood these symbols of consciousness, then already they could understand the seven powers of the human being. When they then comprehended these powers of the body, then they were clever enough to understand the other two complementary powers, the high one of the cosmos and the one under the earth. The Itza brought the knowledge of ATLANTIHA, but being in these new lands of TAMUANCHAN, developed more spiritual knowledge together with the inhabitants of these new lands, with those who are today called the Maya. In this manner the Maya inherited the knowledge of the ATLANTIHAS; for many thousands of years this Magnetic Pole of Spiritual Education was in the power of the Maya. They, with what they learned from the Itzaes in their time together, developed this cosmic wisdom even more. Then they created with their sacred language the word of HUNAB K'U, so that with this word they would represent the great concept of the creation of the universe." Hunbatz Men, elder, Itza Maya Tradition. "It is important to understand about your own Kundalini, as Self realisation is Self knowledge and the one who gives Self knowledge is your own Kundalini because when she rises , she points out what are the problems on your Chakras. Now we say that it is pure desire. It is your chaste desire. It has no lust or greed in it. That power is your Mother and She Is settled down in the triangular bone. She knows everything about you just as a tape recorder. She is absolute knowledge. Because She is so pure that whatever Chakra She touches, She knows what is wrong with that Chakra before hand; so She is quite prepared and She adjusts herself fully so that you do not get a problem by the awakening. If any Chakra is constricted , She waits and goes on slowly opening that Chakra. The Kundalini is the primordial power and is reflected in you. In a human being, it is like many strands of energy, like rope. This energy is all twisted together to form that Kundalini. In a human being the strands are 3 x 7 = 21 Nadis raised to the power of 108. When your kundalini rises, one or two strands out of this come up and pierce the fontanelle bone. It has to pass through the innermost nadi known as Brahma Nadi. It is a spiral movement throughout. The kundalini is spiral and nadis are also like a spiral. The outer most nadi is the right side Nadi, “Pingala Nadi”. The second innermost is Ida Nadi. She starts sending these threads through Brahma Nadi; by that they relax the centre. By relaxing of Centre, the sympathetic nervous system also starts relaxing, your pupils start dilating and when it has pierced the Agnya, then the eyes will be completely dilated and shining. Then She enters into Sahasrara. It is absolutely the pure light of knowledge of love, compassion and attention. All these things are in that energy. We know of many energies like electrical, light energy etc. These energies cannot think. They cannot adjust and work on their own. They have to be handled by us. But this energy itself is the living energy and knows how to handle itself. It thinks. If you see a seed being sprouted, you will find at the tip of the seed, there is a small little cell which knows how to go around the soft places, how to encircle the stones and how to find its way towards the source. That cell has got a little Kundalini in it. But within you a tremendous force of Kundalini exists. When a realised soul says that he should have more compassion, as my compassion, is not alright; my concern about others, my generosity is not alright, I have exploited other’s love. Then this energy starts moving, giving you that greater dimension of love and compassion. If you do not want to grow in your awareness then She does not supply the energy which is stored in you. The Kundalini is there to nourish you, look after you and make you grow by giving you a higher, wider and deeper personality. All her power is nothing but love. She gives the power to forgive. Even when you think, the energy for thinking comes from Kundalini because you are asking her help. The power of Kundalini is absolute purity, auspiciousness, holiness, chastity, self respect, pure love, detachment, concern, enlightened attention to give you Joy. As a mother will try whatever is possible to give Joy to her child, in the same way, this Kundalini has only one power and that is how to give Joy to her own Children. When we talk in the light of Kundalini, we have to understand that this light spreads in your life, outside your life and expresses itself in a very beautiful manner. When you worship Adi Kundalini, the reflection in you, which is your Kundalini, is very happy. Also the deities feel happy. The power of Kundalini which is your own Mother has to rise and manifest itself, because of your Pure Desire. In your introspection, pujas and in your Meditation, you should see for yourself, why are you in Meditation. It is for Pure Desire of compassion and love to be awakened within us. The growth has started and you will find that this shell which is human conditioning and ego will just break open. It is in the triangular bone, which comes up, manifests and can save the whole world. Just see the magnificence, the expansion, the greatness of this Kundalini which was within you and which came up in its full strength and has shown tremendous things. The joy we feel during music recitals is because Kundalini is dancing. She gets happy because you ask for nothing but enjoyment of collectivity. You are yourself fully connected when you are absolutely detached and your Kundalini is dancing. You are alone and never alone. This oneness with the whole gives you all the security and joy you want. That’s why the Kundalini awakening means collectivity. Unless and until you want pure collectivity in your being Kundalini won’t rise. When you worship Adi Kundalini, You are trying to cleanse your Kundalini, as well as please the Deities. This is an object. It cannot be changed. But the reflector can change. The movement of Kundalini depends on temperament of person. Kundalini can give you honesty, and faith in honesty by actualising the experience. Supposing you want to go to a garden and you are suddenly there. Then you will know that your desire is pure and it has worked out. All such miracles happen. The pure desire works out because it is powerful. When it works, the whole thing works out and you develop faith. That faith is within you. Nobody can challenge you, if you have faith, it will be done. Your Pure desire is now being fulfilled, you are now connected and you are now Divine. You are realised souls. You are different from others. For you, all this subtle knowledge is being absorbed, because your Kundalini is absorbing it. Whatever is absorbed is absorbed back by me. But that becomes like a barometer. You immediately know without thinking, asking, you know about anyone because Kundalini is the reflector. The better a reflector, you become, the more the Kundalini shows. Though Kundalini is an individual Mother, in her functions and methods. She is just the same. You cannot cheat the Kundalini, She knows you out and out. We must meditate to get into thoughtless awareness by which we allow the Kundalini to grow." "I am here to tell you about the last breakthrough of our evolution. This breakthrough of our evolution in our awareness has to happen in these modern times and has been, moreover, recorded in the writings of many seers. These are the times called as the "Decadent Times" last called by the great saint Vyasa who has written the Gita, and it is the decadence of humanity that we see around in every way possible. Now I would like to tell the secret knowledge of our inner being which was known in India thousands of years back. For our evolution and spiritual ascent there is a residual power within us which is located in the triangular bone at the base of our spine. This residual power was available thousands of years back in India, the awakening of the Kundalini was done, traditionally, on an individual basis only. One guru would give awakening to on disciple. As a result of that awakening, what happens is that you achieve your self-realisation, your self-hood. Secondly, when this power is awakened, it rises and passes through six subtle energy centres in your body, nourishing them and integrating them. Ultimately this power breaks through the fontanelle bone area called as the Talu or Divine Love, which is described in the Bible also as the "cool breeze of the Holy Ghost", also in the Koran as "Ruh" and also in the India scriptures as "Paramchaitanya". Patanjali has called it as "Ritambhara Pragya". Whatever the name, this is a power which is all-pervading, which does all the subtle works of living process, of evolutionary process. The existence of this all-pervading energy is not felt before realisation but after self-realisation you can feel it on your finger tips or at the centre of your palm or above the fontanelle bone area. May the Divine bless you all. "But today it is the day I declare I am the One who have to save the humanity. I declare I am the One who is Adi Shakti, who is the Mother of all Mothers, who is the Primordial Mother, the Shakti (Divine Primordial Power) of the Desire of God, who has incarnated on this Earth to give meaning to itself, to this Creation, to human beings, and I am sure that through My Love and Patience and My Powers I am going to achieve it. I was the One who was born again and again. But now I have come in My complete Form and with complete Powers. I have come on this Earth not only for salvation of human beings, not only for their emancipation, but for granting them the Kingdom of Heaven, the Joy, the Bliss that your Father wants to bestow upon you." “We are living the times of the prophecies and now in another calendar of Ox Lahu Baktun. It also talks about the cycle of the great changes. In this cycle of the 5085 years in the Mayan calendar there are still 15 more years to go before this calendar can be completed. When this cycle is completed and another restoration of the planet will begin. The world once again has fallen into neglecting nature. The world has been led by the materialistic ways, and humanity needs to transcend this cycle and to live in a more subtle dimension. Right now only the spiritual people in this planet are living this process. The indigenous groups of the planet are also living this process. But the great majority of humanity has no idea of these changes. These changes can be very catastrophic. It is my goal that the different indigenous and spiritual groups might come together as the new warriors of the light. With their tools of love they bring the message to humanity that their attitude needs to change. We need these positive attitudes as far as the different indigenous and spiritual groups and their relationship with nature, with our brothers and sisters the trees, with our brothers and sisters the animals, and with our Mother Earth. Even though we have neglected and abused Mother Earth, we have taken her skin off, we have contaminated her waters, we have contaminated her wind, she is still serving us in a great way. Disobedient children we have been, yet she still loves us and nurtures us. We must understand that Grandfather Sun shines its light on us, no matter what color or shape or size we are. We must see each other with this attitude in mind. If a great part of humanity begins to understand this process, not only on an intellectual level, but also at a level of living it, those drastic changes that those prophecies talk about might not be so drastic. The Bible tells us to seek the kingdom of heaven, and all else shall be added unto us. Yet, if our subconscious mind believes we can't enter heaven, then we are trapped here on earth. If the childlike subconscious mind believes that we can't enter heaven until we die (as dogma-spouting ministers tell us), then we will not try to ascend while we are still alive. Thus, we construct our own prison bars -- mentally. The reptile symbolizes the "dragon" which "guards the door to heaven". We can't enter until the subconscious realizes that it can indeed open the door. It's interesting to note that Christian, Egyptian, Mayan and Oriental religions all predict a time when man will again perform in accordance with his true design. The Sphinx sits on a circle in the Egyptian desert. Half virgin, half lion, the structure faces 180 degrees across the circle. Its placement indicates the time of its construction as some time between the Ages of Virgo and Leo (Which are astrologically symbolized by a virgin and a lion). It gazes directly across the circle at the cusp of Pisces and Aquarius which is our current time period. This is the time that the Egyptians believed they would again reincarnate into the earth plane and be able to ascend the "staircase to heaven". Interesting prediction is it not? The ancient Mayans were also avid astrologers. The Mayan calendar was constructed to accurately predict the time when God will create a sixth new world. They believed we all live in an astrological hoop of life. After incarnating to learn life experiences during each of twelve astrological ages, some of us will be ready for new experiences at a higher vibratory level. Those who still believe in God after the hoop of life is completed will live in a new world that God creates for them. The Mayan calendar predicts that God's sixth new world will be completed by December 21 in the year 2012. “Through Solar Initiation they will be able to see the luminosity of the great spirit... through Solar Initiation, the sleeping body of mankind can be awakened... Hunab KÆu (God in Mayan) will flash like lightning that will pierce through the shadows that envelop the human race. Let us prepare to receive the light of knowledge that comes from Hunab KÆu and transcend into the memory of the creator and become beings of eternal luminosity. “This is the essence of the Gnosis achieved by not only the Maya, but most likely all the great civilizations of the Americas at one time or another. As each indigenous American came to this realization, their need for a civilization disappeared into time and the memory of man. As each civilization rose to attain its own brand of highly pragmatic Gnosis, its people reverted to a simple existence without the need of kings, priests, government, or civilization. However, each vanishing civilization left the seeds of their knowledge so that those who would eventually come after might replant, nurture, and perhaps bring forth an even more beautiful creation. “The Maya developed their calendar long before the Julian or Gregorian calendars came into existence. The Mayan Calendar is based on naturally occurring energy cycles and a close connection to Mother Earth, the Sun, and the Pleiades. Because the Maya honored Mother Earth and the energy cycles that are present here, they were in tune with the cycles. They had access to information that is not available to 'modern people' because 'modern people' are extremely limited by their belief systems. Time is not linear. We have been taught to think of Time as only going forward, from one point to another. I think it is more accurate to think of Time as a spiral, as cycles. In an ancient time, our Mother Earth was pristine and all of her life forms lived in harmony and honor. It is possible to heal the Earth and restore Her to her pristine state by merging the Ancient Times with the present. To accomplish this, we must first rid ourselves of the limitation of believing that Time is linear. The Mayan and Dreamspell Calendars can assist us greatly in coming to a greater understanding of Time. It is something that must be experienced. It is difficult to put into words because our language lacks the terms to express the nature of Time.